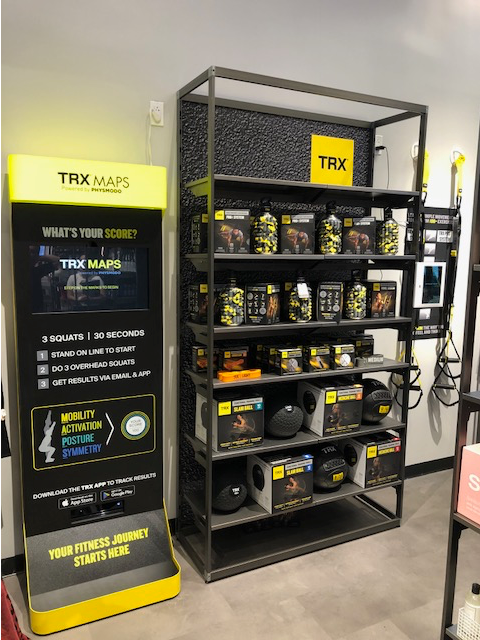 Bloomingdale’s has partnered with TRX, the maker of fitness equipment and app-based training technology, on Carousel, an immersive, rotating pop-up shop inside select stores. The pop-up features an “Urban Explorer” theme that takes consumers on a tour of the urban wilderness, bringing a chic outdoor aesthetic into the concrete jungle with an assortment of tactical gear (TRX and its Functional Training Tools) and functional fashion. TRX plays a major role in the “Urban Explorer” shops with an assortment of TRX’ well known black and yellow suspension straps and training gear, creating the ideal home gym solution in any size home. Fitness enthusiasts can sign up for free TRX classes hosted in-store by TRX master instructors. TRX MAPS, powered by Physmodo, will also have a presence in the Urban Explorer shop and provide users an interactive, complete body movement assessment in less than 30 seconds, including mobility, activation, posture and symmetry. Results are delivered on-screen an via e-mail with targeted exercise plans that will help users move better in sport and in life. In addition to TRX classes, the Urban Explorer shop will feature a steady rotation of events throughout the months of September and October. Each Thursday night Bloomingdale’s shoppers can get a taste of their city with events hosted by local wineries and breweries. The shop will also feature constant animation from the brands involved. Vendor activations include everything from a running and meditation class with the founder of District Vision, shoe shines and sneaker touch-ups with Jason Markk and a discussion about beauty routines with a Goop editor. Visit bloomingdales.com/events for a full listing of events. The Carousel will launch in four Bloomingdale’s locations: 59th Street and Soho in New York and Century City and San Francisco in California. It lives in a dedicated, differentiated space within each store and creates an experiential shopping atmosphere with eye-popping visuals and interactive elements. Weekly events animate the space and bring the merchandise and concepts to life, making it a must-see destination for shoppers looking for shopping inspiration. Driven by guest curators, each shop introduces a unique theme with an unexpected mix of products brought to life by immersive, in-store experiences. The Carousel will be refreshed every two months with a new of-the-moment theme and feature a constant rotation of animation and events to amplify the customer experience. The first installment, entitled “Urban Explorer,” takes you on a tour of the urban wilderness, bringing a chic outdoor aesthetic into the concrete jungle with an assortment of tactical gear and functional fashion.